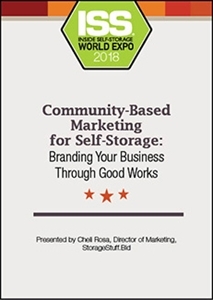 The most genuine way to build your self-storage facility's reputation is through community involvement. Learn about “doing good and giving back,” and how to encourage employee participation. The most genuine way to attract people to a brand is word-of-mouth. People are far more likely to accept opinions that are passed through friends and family. A wonderful way to build your reputation is through community involvement. In this session, our presenter will share a marketing approach that focuses on “doing good and giving back” in the community.